If you're stuck in a holiday outfit rut, here are some ideas that are a little different from the traditional little black dress and bling! Warning, I'm drinking a lot of champagne in this blog but hey, tis the season! Fringe or tassels will make your outfit super chic, especially in black! I personally selected some fringe pieces I love for you. Skirts: HERE and HERE Dresses: HERE (LOVE SO MUCH!) and HERE. My clutch has a chain detail...here are other styles I'm crazy about HERE and HERE (VERY similar to mine!). Or how about a fringe top? Here are some ideas for you, HERE and HERE. For those more casual parties, a fringe cardigan punches in a little pizzaz. Add a splash of patent leather, fabulous heels and a pearls for a party-ready look! Nothing says holiday glam more than faux fur---but you don't have to get dressed up to wear it! A faux fur collar coat dresses up the simplest of outfits. Love these options HERE (need!! ), HERE (want!! ), HERE (need!! ), and HERE (want!!). I actually don't need any, but want them all! 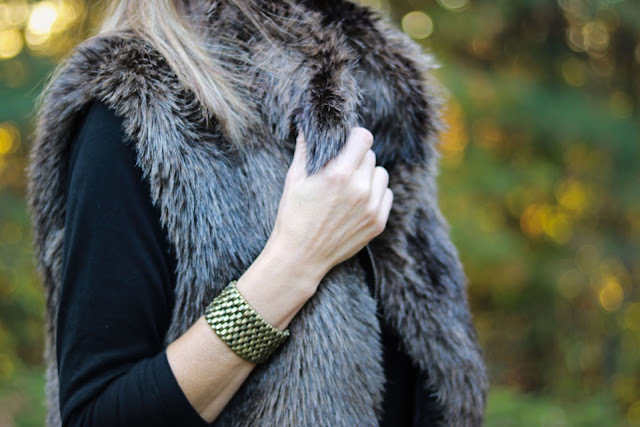 Or layer a faux-fur vest over a little black dress or sweater and jeans for casual but chic look. 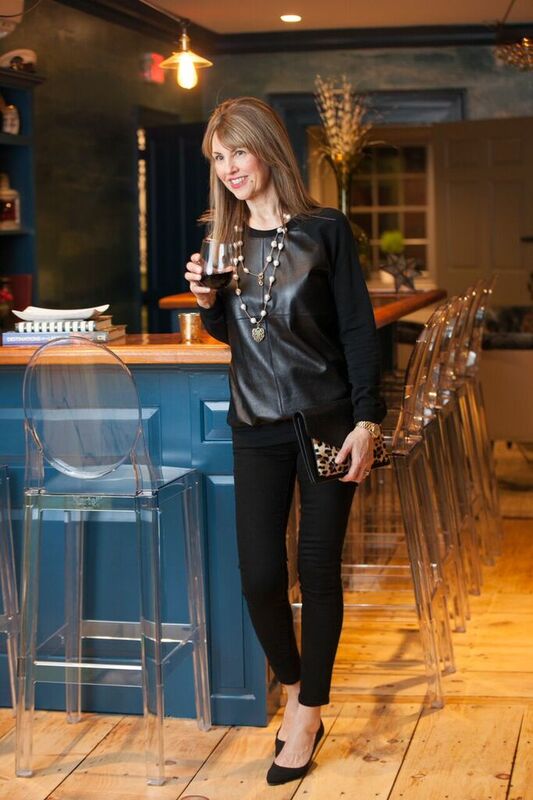 Leather is a wonderful option for the holidays if you like an edgier look (which I personally love). Here are ideas for a top (HERE and HERE) or vest. I recently went to a holiday party and switched up the bling for a bold print. I took a selfie (above) which I posted to Instagram. This dress is by Tory Burch. I'm gaga over this one by Ted Baker, which is perfect for a New Year's Eve party. 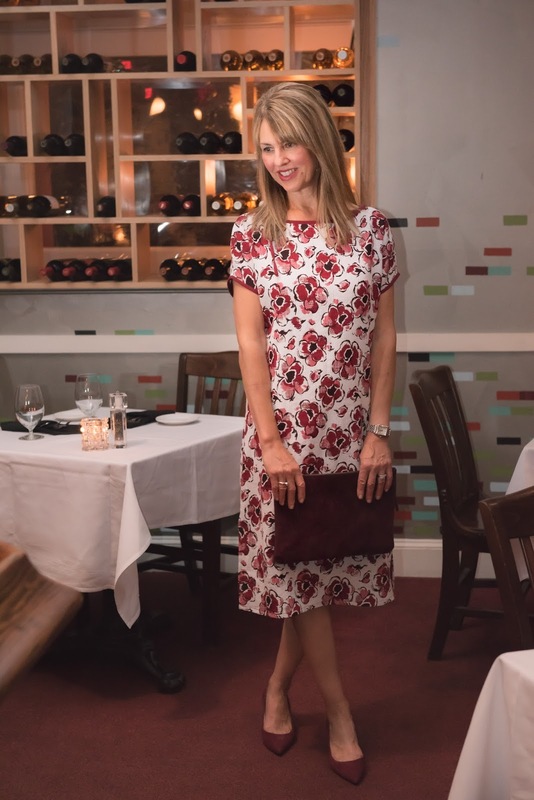 I blogged about this Laura Tanzer dress several months ago. It's such a great dress and would perfect for a holiday party. With this bold print, keep jewelry minimal and let the dress do the talking! Clutch and pumps ideas HERE (can I trade mine in--love this one! ), HERE and HERE. And there you have it. I hope your holiday season is off to a great start!